What medical condition takes my strongest, toughest patients down to their knees in pain? Kidney stones. I'm going to discuss kidney stones risk factors, common causes of kidney stones, kidney stones treatment, passing kidney stones and much more. While most people do not consider kidney stones to be precious gems, some celebrities have actually sold the kidney stones they have passed for money. Gene Simmons of KISS reportedly sold one of his passed kidney stones for $15,000 and William Shatner has been reported to have sold one of the kidney stones that he passed for $75,000. They reportedly donated the proceeds to charity. I guess one man's trash is another man's treasure, but I digress. What is a kidney stone? A kidney stone is exactly what it sounds like, it's a rock in your kidney. But how does the stone form? A kidney stone forms when you have particles or substances in your urine that stick together. They usually stick together when they are in high concentrations in your urine. Once these particles stick together, they form a crystal. That crystal adheres usually to the inside of your kidney. As time goes on, more and more particles or substances stick to that crystal, that crystal becomes larger, and you develop a kidney stone. There are different types of particles, which tend to form stones. These particles include substances like calcium, oxalate, cysteine, and uric acid. As urine flows through your kidneys, that flow can cause your kidney stones to move towards your bladder and into the direction of the outside world. If the kidney stones are small enough, they can fit through the tubes inside of your kidney and your urinary tract system, and you can actually pass the kidney stone. How Do You Pass Kidney Stones? The kidney stones pass as you urinate with the rest of your urine. Granted even if kidney stones are small enough to pass through your kidneys and the urinary tract system, they often cause scrapes and scratches inside of your kidney as they pass, and this can be very, very painful. If you think about the path that the kidney stone must take in order to get out of your body with the urine, especially that final pathway that exits to the outside world, especially in men, ouch. 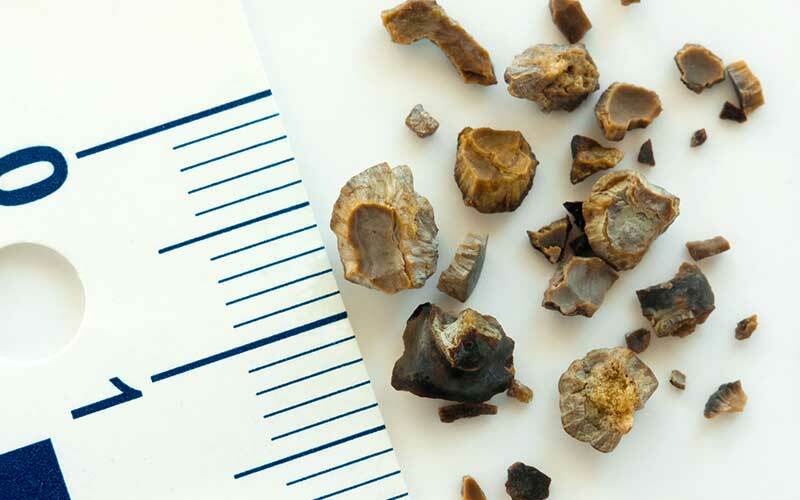 Nevertheless, some kidney stones are actually too big to pass through your kidney and your urinary tract system. These stones can get stuck inside of the kidney. They can cause great pain, they can cause blockage, they can even cause infection and kidney failure, or they can cause no symptoms. Pain is the most common symptom. You can get pain in your flanks, which is that area between your ribs and your hips and your lower back. That pain can come, that pain can go, that pain can be throbbing, that pain can be excruciating, and that pain can also radiate towards your groin. You can also get nausea, vomiting, abdominal pain. Blood in the urine is another symptom of kidney stones or nephrolithiasis. The urine can appear just a pinkish, light color, or it can be outright red like blood. Other symptoms include urgency. When you feel like you've just got to go run to the restroom to urinate, but when you get there you don't have to urinate. Dehydration is one. If your urine has insufficient amounts of fluid, then those particles will be in high concentration, which puts you at a risk for forming stones, as those particles stick together in your kidney. Some disease states put you at risk for kidney stones. Diabetes, gout. If you are obese, you are at a higher risk for kidney stones. Other kidney stones risk factors include Chrones disease or if you have had gastric bypass surgery, you are at an increased risk. Also, having high levels of calcium in your blood will put you at risk for kidney stones, as in hyperparathyroidism, and your diet can be a risk factor. How can you be diagnosed with kidney stones? Well, certainly a good history and physical by your doctor can help to make the diagnosis, but then there are also imaging studies. You can have a CAT scan, a very specific one, a helical CT with no contrast. Also, ultrasound of sonography. The same way that pregnant ladies get sonograms of their bellies, you can get a sonogram of your kidneys and that can help to identify kidney stones. If kidney stones are asymptomatic, you may not need any treatment. If you don't have fever or infection or great pain, you really could just live with the kidney stones with no treatment at all. However, if the kidney stones are enough to cause symptoms, then you will most certainly need treatment. If you have kidney stones that are small enough to pass, they would need to be nine millimeters or less at least, and if you're able to take in food, take in drinks, then it's possible that you can be treated by your doctor for kidney stones at home. It would require that you drink plenty, plenty of fluid. Most people would need to take in at least three liters of fluid per day, but you would take your doctor's advice for that, and it would require pain medicine, of course, if you're in pain. NSAIDS or the non-steroidal anti-inflammatory drugs, like Advil, ibuprofen, usually work well for kidney stones. However, you need to consult your physician first in case these medicines are contraindicated for you. If you are sent home for treatment, you may be asked to strain your urine so that you can catch the stone and take it back to your doctor for analysis. Now if you are a patient with a kidney stone that is too large to pass, ten millimeters or greater, or if you are a patient who is having extreme nausea, extreme vomiting, or pain that just can't be controlled with by mouth medications, you may need to be treated in the hospital. In this case, you may need IV fluids to make sure that you stay very well hydrated, that you make urine, which helps to pass stones if they're passable. You may also need IV pain medications. If you have kidney stones that are actually too large to pass, then you may require procedures at which time a urology consult is indicated. One procedure is a ureteroscopy, where a thin camera is actually passed through the urethra, the hole where the urine comes out, and that camera is threaded up through the urethra, through the bladder to the ureters and that stone is actually retrieved and removed from the body. Another procedure is shockwave lithotripsy. This is when shockwaves or sound waves actually break up large stones into small particles or smaller fragments that are able to be passed with the urine. Another procedure, one that's a little more invasive, is percutaneous nephrolithotomy. This is when an incision is made and the kidney stone is actually surgically removed. Now no one wants to have painful kidney stones if they don't have to, and the chances of you being able to sell your stones for cash, like William Shatner and Gene Simmons are slim to none. Let's talk about how to prevent kidney stones. Staying well hydrated is one way to prevent it and most patients will need at least two to three liters of fluid per day or more. You must consult your physician. The proper diet to prevent kidney stones really largely depends on the type of kidney stones you have. Do you have a calcium oxalate stone? A uric acid stone? A cysteine stone? For most patients with calcium oxalate stones, for example, a low oxalate diet is indicated. What has oxalate? Spinach, rhubarb, tea. Also, a low sodium diet is helpful for most patients, but patients should maintain normal calcium intake. Depending on your type of kidney stone, you may need medications to help. Hydrochlorothiazide helps in some cases, as well as potassium citrate. It really depends, so you must go to your doctor and have your stones or your urine analyzed. You can have your stones analyzed certainly if you catch the stone by straining your urine and that's helpful in determining your type of stone and how to prevent it. Even if you don't catch the stone, you can do a 24-hour urine collection, which is really helpful because it can be used to analyze the particles in your urine that are likely to form stones in you. This ends my overview of kidney stones risk factors, symptoms, and treatment. If you have kidney stones, you are among some of the great. Billy Joel has had kidney stones, Alfred Hitchcock, Michelangelo. If you do have any of the symptoms I described or if you've been diagnosed or if you have some of the conditions that put you at risk, like diabetes, obesity or gout, please, please see your doctor and seek treatment and evaluation. Let me know in the comments what else you'd like me to talk about and I'd love to hear about your experience with kidney stones. Does a patient’s dithering about whether to seek treatment for a too-large-to-pass kidney stone, one that is irritating and sore, increase theoretical risk over time for damage and changes at the cellular level (i.e. cancer)?